1. Launch the Exchange Management Shell > Firstly lets get the names of my Databases, then I can simply copy and paste them into the move mailbox command. 2. The Mailbox moves should then be queued, depending on how many there are, this can take some time to complete. Execute the following command $LiveCred = Get-Credential and enter the admin credentials in the popup dialog. 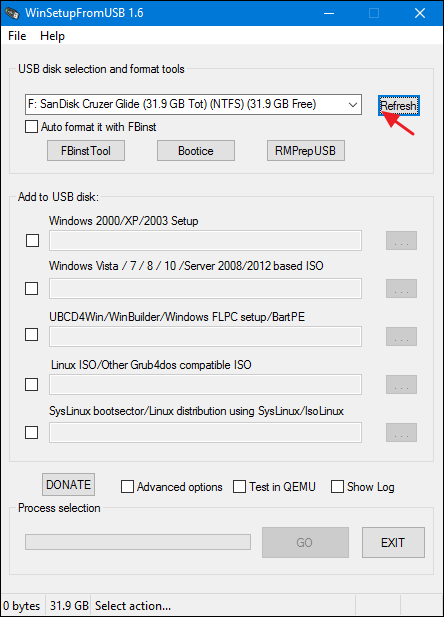 Here is a quick and easy way to make a bootable USB from a .ISO file, no 3rd party apps required. Note: You’ll need to be an administrator to do this. Lists out all disk drives and their volumes. Drives are labeled as disk0, disk1, disk2, etc. Volumes are labeled disk1s0, disk1s1, disk1s2, etc. For our purposes, we only care about the drive. In this case, we’re going to assume our flash drive is disk2. “sudo” tells the system to use root level (that is the system’s highest level) privileges to perform the following action. “if” stands for input file (a.k.a the source file or location). In our use-case, this is the .ISO file. In MacOS, if you have a finder window open, you can drag and drop the .iso into the terminal and it will auto-fill this file path. “bs” stands for block size. dd copies data in blocks rather than on a file by file basis (this is why it’s so fast) and this command gives you the option to set how big each block is. There is a science to the ideal block size, but I don’t know it. 8m (MegaBytes) has consistently worked well for my uses. The command will not show any progress until it’s done, but you can press control+t for status updates. With an average computer, this takes less than 5min to complete. The USB drive can now safely be removed. Assuming that the iso is EFI-compatible, you can reboot your mac to test it. Here is some useful ways to get reports of your Exchange environments. *When you run the script it will ask you where you want to save it. Loop protection provides protection against loops by transmitting loop protocol packets out of ports on which loop protection has been enabled. When the switch sends out a loop protocol packet and then receives the same packet on a port that has a receiver-action of send-disable configured, it shuts down the port from which the packet was sent. So it’s not doing anything fancy – just using its own protocol packet to detect loops back to the switch itself. Note this is different to Cisco’s loopback detection, which will detect a switchport looped back on itself – e.g. due to faulty wiring – but will not detect a cable run from one port to another on the same switch. Configuration is quick and easy, and it seems to work well. 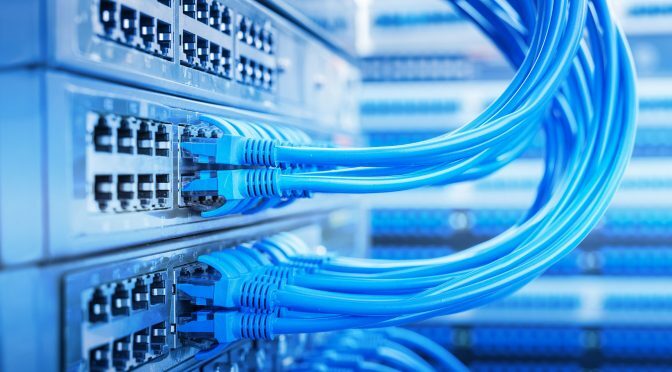 It should work well in any situation where you have edge ports that users might connect together, possibly via a ‘dumb’ switch that doesn’t forward STP BPDUs. These loop protection frames should be forwarded. transmit-interval     Set time between packet transmissions. I 05/18/13 17:13:30 00884 loop-protect: port 22 disabled - loop detected. So now you can set a disable timer, and once users remove the loop, their network ports will come back up, without needing any input from the local network admin. All up, this is an easy feature to configure, and should be used on all edge ports on Procurve switches. 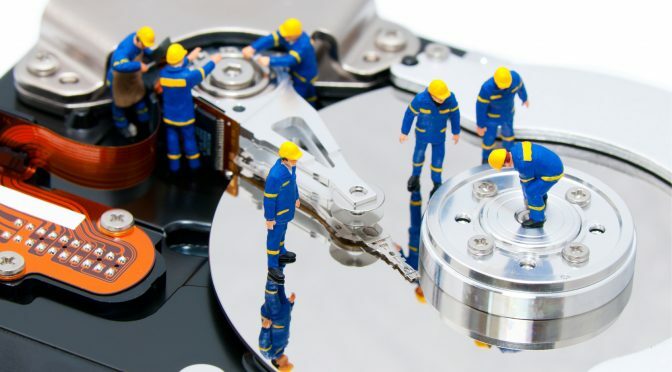 Disks become cluttered with legacy and temporary files which use up valuable disk space. We will do this using the Set-MailboxFolderPermission command. Click the link to see the full list of parameters you can pass in to the command. We will be using ‘limited details’ for the AccessRights variable. We will do this using the Set-CalendarProcessing command. Click the link to see the full list of parameters you can pass in to the command. The next step is to install the UniFi Controller software. *The installation takes a couple of minutes to complete, but is fully automated and includes all the prerequisite components such as MongoDB and OpenJDK Java 7. Without making this small configuration change, you will have two separate instances of MongoDB running; an unused default database instance, and the UniFi database instance. This is obviously not desirable on a device with limited resources, such as the Raspberry Pi. 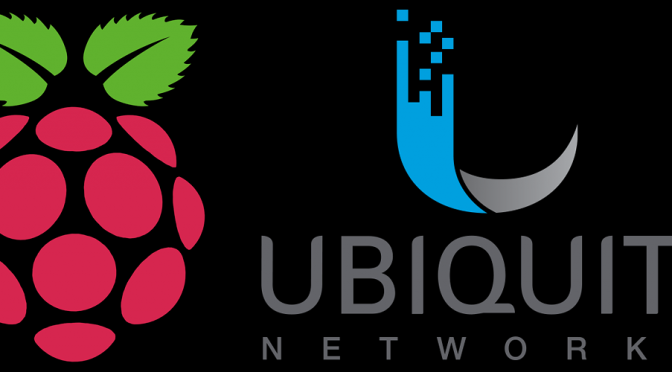 *This fixes a number of issues particularly with the older models of Raspberry Pi, but also brings the library well up-to-date as the version Ubiquiti includes with the UniFi package is from 2013. Before updating the UniFi Controller software, it is highly recommended that you first backup the controller configuration. The UniFi Controller software will be updated along with all other packages installed on your Raspberry Pi. You’ve got your collection of Windows ISOs and maybe you’ve burned installation DVDs or flash drives for them. But why not make yourself a master installation drive that you can use to install any version of Windows? 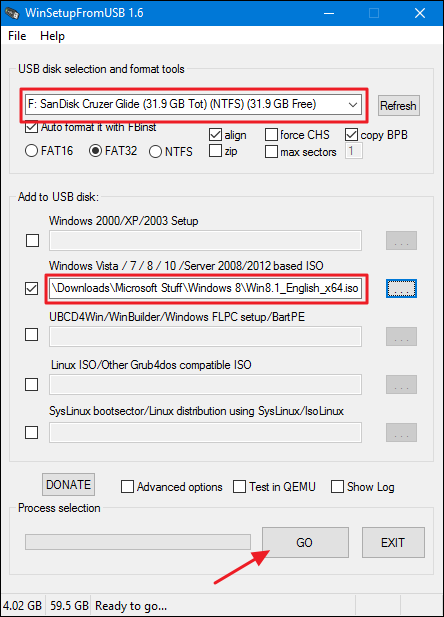 Setting up a bootable USB Drive that includes multiple ISOs is actually pretty easy, We’re going to do it using a clever little free tool named WinSetupFromUSB, so go ahead and download the latest version of that. You can even include some non-windows ISOs on the disk, like Linux distributions and antivirus rescue disks. 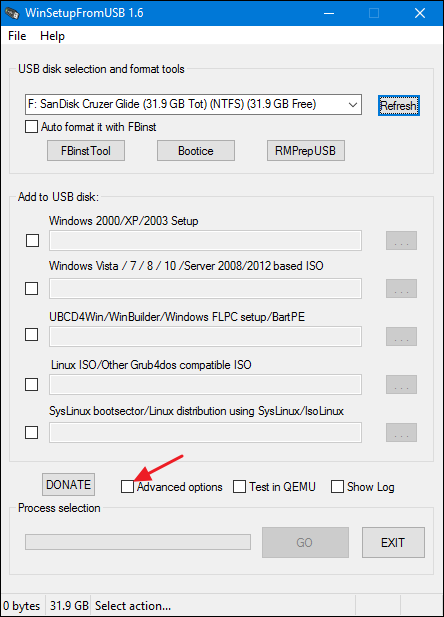 For a complete list of what you can include on your USB drive, check out their supported sources page. There is one important note from that page worth calling out. The tool works with single Windows ISOs from Microsoft. If you have a dual ISO that includes both the 32-bit and 64-bit versions of Windows, you won’t be able to use it. But you can always download single ISOs (one for 32-bit and one for 64-bit) and stick them both on the USB if you need to. Next, make sure you have blank USB drive big enough to hold all the ISOs you want to install, along with a little extra space. A 16 GB drive should give you enough space for two or three versions of Windows. If you have a 32 GB drive, you should be able to fit all the versions of Windows you could want. If you want to include other ISOs as well, you might need a bigger drive. WinSetupFromUSB is a portable tool, so there’s no installation. Once you have it downloaded, double-click the archive to extract the files a new folder. If you’re running a 64-bit version of Windows, run the executable with “x64” in the name. If you’re running a 32-bit version of Windows, run the file without the “x64” in the name. 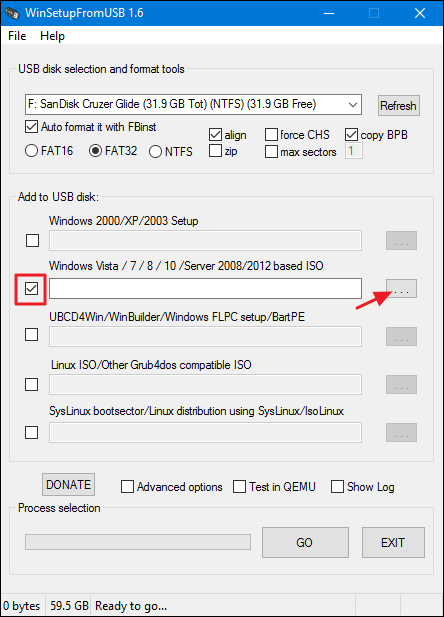 If you already had your USB drive inserted when you launched the tool, it should be listed in the box at the top of the window. If you didn’t have it inserted already, go ahead and plug it in now and then click Refresh. Next, click the “Advanced Options” check box. Instead of working like a regular check box, clicking it opens an “Advanced Options” dialog box. In the Advanced Options dialog, select the “Custom menu names for Vista/7/8/10/Server Source” check box. 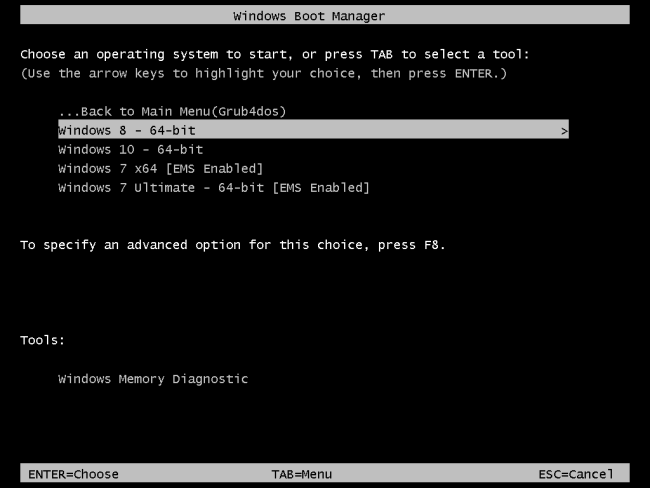 This setting allows you to provide your own names for the folders in which the Windows ISOs are stored and the boot menu names you see when you start a computer using the USB drive. You can close the “Advanced options” dialog when you’re done. Now comes the somewhat tricky part. You’ll be adding Windows versions one at a time. 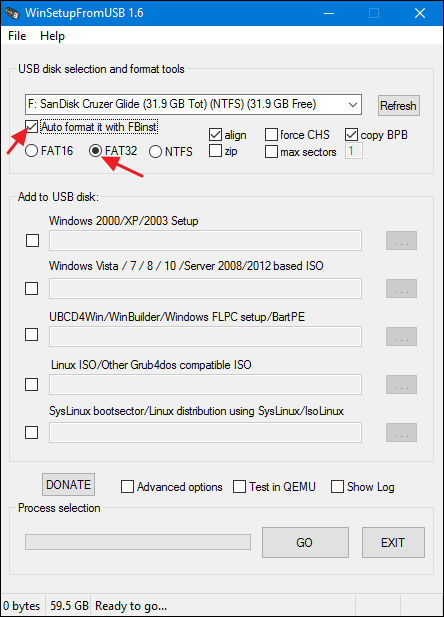 The first time you add something to the USB drive (and only the first time), you’ll want to make sure that the “Auto format it with FBinst” check box is selected. This lets WinSetupFromUSB format the drive appropriately for booting. If you know you’ll be booting a computer in UEFI mode (or if you’re unsure), then select the “FAT32” option. Otherwise, you can use the “NTFS” option. Next, select your first Windows ISO. Select the check box next to the “Windows Vista / 7 / 8 / 10 /Server 2008/2012 based ISO” section and then click the browse button (“…”) to its right. Locate and open the ISO you want to add. 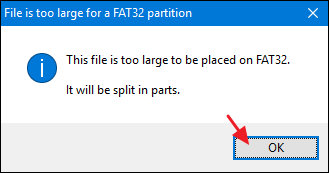 If it’s a large ISO and you’re using the FAT32 file system, you may get a notification that the file is too large and will be split in two. That’s fine, so go ahead and click OK. If the auto format option is enabled (and it should be for the first ISO you add to a disk), you’ll also get a warning letting you know that the drive will be formatted and anything on it will be erased. Click “Yes” to continue. WinSetupFromUSB will now format the drive and then pop up a window where you can enter a custom folder name for the ISO that’s between 1 and 7 characters. If you don’t type anything for 30 seconds, the default will be used automatically. A similar window will now open that lets you type a custom name that should appear in the boot menu. This time, the name can be between 5 and 35 characters, so you have a bit more room to be specific. And again, you have 30 seconds to type a new name before the default is used automatically. At this point, WinSetupFromUSB will begin creating folders, adding the ISO to your USB drive, and adding the options to the boot menu. This can take several minutes and you can gauge the progress in the window’s status bar. 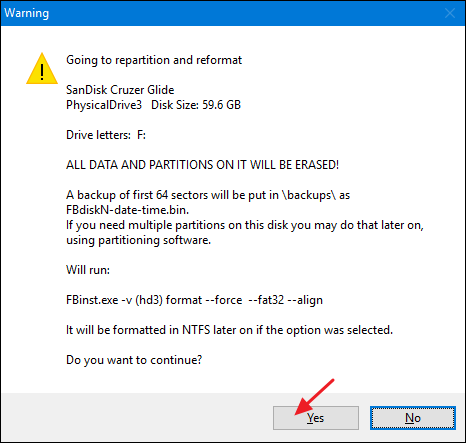 When you add additional ISOs to an existing boot disk, make sure the “Auto format it with FBinst” check box is not selected. It won’t be by default when you return to the window (or when you start the program again), but it doesn’t hurt to make sure. You only want to format the disk with the very first ISO you add. You’ll need to click “Advanced Options” and enable the “Custom menu names for Vista/7/8/10/Server Source” check box each time you add a new ISO. Make sure you don’t forget this step before clicking Go or you won’t be able to add a custom name for the ISO to your menu. While it doesn’t sport the most intuitive interface, WinSetupFromUSB is lightweight and works well. And once you get the hang of adding ISOs to the package, it’s a breeze to set yourself up with a powerful boot disk that will let you install whatever version of Windows you want, as well as a number of other bootable tools.